HOUSTON (CN) — With their homes soaked by Tropical Storm Harvey, some Houston residents are uprooting their lives, choosing to move out of flood-prone neighborhoods before the next big storm hits. Gov. Greg Abbott said Sunday that Texas could need up to $180 billion in federal aid for Harvey victims, more than the $120 billion the government spent after Hurricane Katrina pummeled New Orleans and other Southern cities in 2005. Harvey has left more than 50 people dead, displaced more than 1 million Texans and damaged around 200,000 homes. 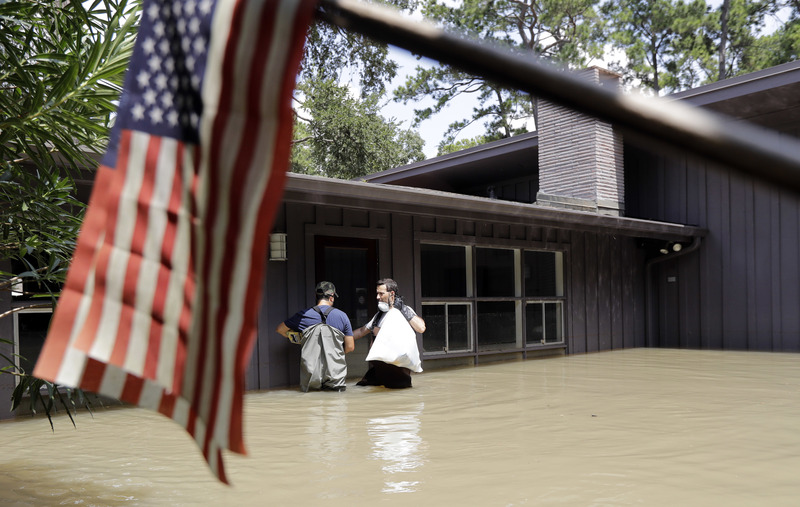 The Federal Emergency Management Agency says 500,000 Texans already have applied for aid. Keith Thomas, 64, is not one of them. Thomas sat in a lawn chair in the front yard of his northwest Houston home on Labor Day, watching neighbors and volunteers from The Church of Jesus Christ of Latter-day Saints pull out drywall, flooring and doors that were wrecked when waters from a bayou behind his home and the street in front converged early Sunday, Aug. 27 and flooded his house with 20 inches of water. Thomas, who is retired, said he applied for FEMA aid after Tropical Storm Allison flooded his house in 2001, but was turned down because his income was too high. Harvey dropped a record-breaking 51 inches of rain on Houston, while Allison dumped more than 35 inches and caused $9 billion in flood damage in the city. Thomas has already made up his mind to get out of his flood-prone neighborhood. “I’m moving. 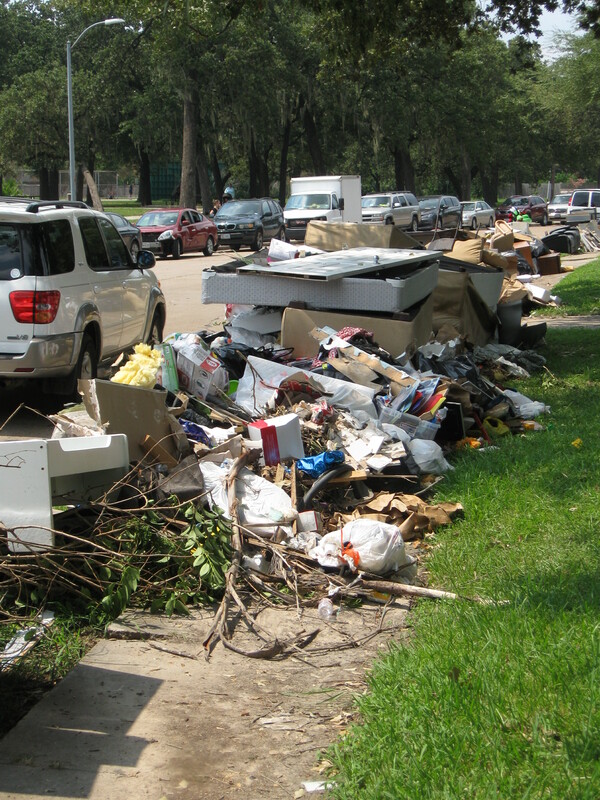 Twice is enough,” said Thomas, who seemed remarkably upbeat, punctuating his words with a raspy laugh, watching volunteers pull debris from his home to the front yard in large sleds and dump it on the curb. 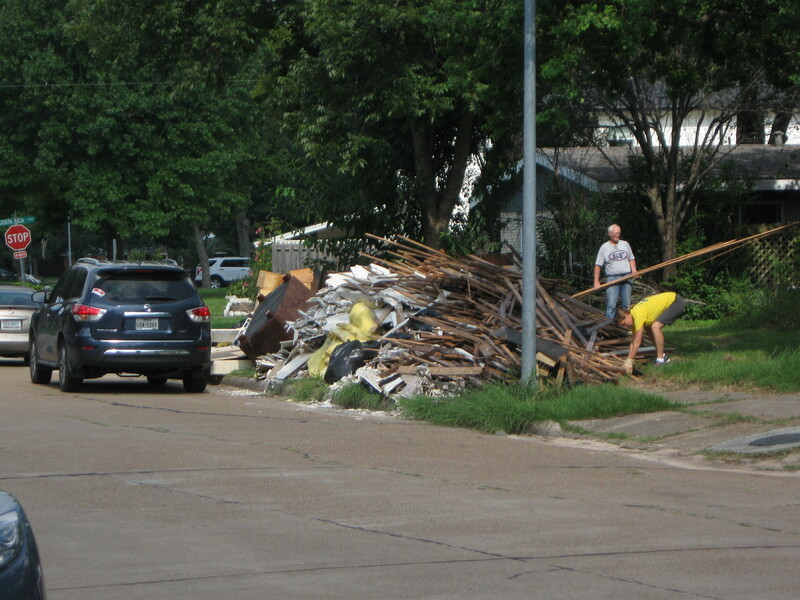 He said he was surprised at how many volunteers had turned out to help after Harvey in contrast with the aftermath of Allison, but his thoughts were on the government regulations, or lack thereof, that have affected his life. “I wish they’d spend the money to fix the flooding. Make laws so that the builders have to build higher. My pet peeve is, when they build a house all these foundations are right on the ground. Look over there at some of those houses. They’ve got a slope on their land. Why didn’t they put a slope here?” he asked, looking south across a park in front of his house to the homes on its far side. Ryan Hultquist, 47, took a break from helping dismantle Thomas’ home and stood by Thomas’ chair under the shade of a pecan tree, a leather tool belt on his waist. Though President Donald Trump visited Sunday with 2,500 flood victims who were forced to take shelter at the NRG Center in Houston, and has asked Congress for $14 billion in aid for Hurricane Harvey relief, Hultquist said Trump was too slow to respond to the crisis. “First trip here to Texas he didn’t even talk to any victims, all he did was hold a rally,” said Hultquist, referring to Trump’s Aug. 29 trip to Corpus Christi after Harvey made landfall near the town on Aug. 25 as a Category 4 hurricane. “He’s always doing the right thing, two or three steps behind. You know? He does something and he’ll be like, ‘Oops, I shouldn’t have done that. Let me go back and make it right.’ Well, you know, like they say, your first instinct, your first reaction, that’s the true self,” Hultquist said. Hultquist said that like Thomas, whom he’s known since he was 2, he’s moving north because his home flooded in Tropical Storm Allison, and Harvey inundated it with 10 inches of water. As he told how four Texas National Guardsmen, his brother and some friends took just two or three hours on Aug. 27 to tear out drywall and flooring in his house, Mormon volunteer Courtney Park approached and handed him a tool she’d used to mark the walls in Thomas’ home, bubbling with excitement from her newfound skill. “I’m like, ‘Check it out, ladies, look at that 4 feet straight line!’” she said. “Of course,” Park said, nodding. “No, but he’s a Bubba. Bubba’s know. They know,” she said with a laugh. Park said the storm has made her son 15-year-old son Ethan, who was helping demolish Thomas’ home, realize the value of working with his hands, and that she had just heard on a radio program that schools have eschewed apprentice programs to focus on academics. Hultquist said he is an ADP payroll consultant, despite getting his bachelor’s degree in kinesiology. Hultquist has hired a Realtor who’s looking at homes in the northwest Houston suburb of Cypress, an area hard hit by flooding from Harvey. “Two of them that we really liked flooded,” said Hultquist, who is looking for a house with a mother-in-law unit for Thomas to live in. Hultquist said he noticed a friend who owns a house across the street had taken down a “For Sale” sign and jumped at the chance to stay in the neighborhood while he shops for homes. “I called him Monday and said, ‘Hey, no one’s in your house.’ He’s like, ‘No.’ ‘Do you care if we move in for a couple of months?’ I mean it’s perfect. My 4-year-old kid goes to daycare right here on 43rd Street. “I work from home, when I’m not traveling. He’s like, ‘Yeah.’ So he’s helping us out. He said he normally gets $2,000 a month for rent, and we’re paying him $500. If I give him three months, he can do that,” he said. Jeff Rosenbaugh, a 6-foot-5-inch Mormon volunteer, stood in Thomas’ front yard Monday, chugging Gatorade and wearing a gray sweat-soaked T-shirt. 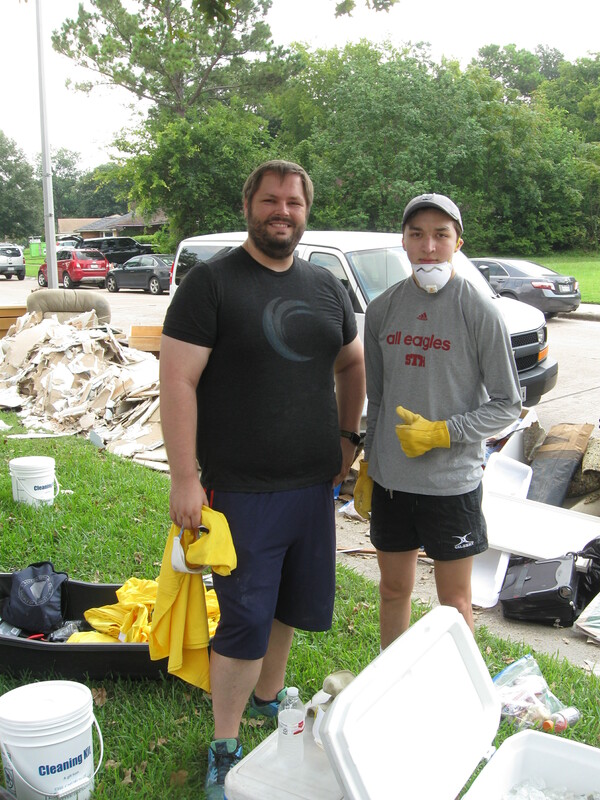 Rosenbaugh, 34, said he moved to Houston shortly before Hurricane Ike struck Houston in 2008, and fell in love with the city when he saw how residents came together to help each other after that storm. Rosenbaugh, who does IT work for Exxon Mobil, said he’s been to East Houston and northern and southwestern suburbs over the past five days with crews of Mormons, helping flood victims gut their homes. He lives in the Heights neighborhood, just north of downtown. “Thankfully, the neighborhood lived up to its name and we were OK. I think it flooded about a mile east of us,” he said. With his office closed all last week, Rosenbaugh said he felt compelled to get out of the house and volunteer. He said his wife is experiencing a lot of “flood guilt” because she’s stuck at home with their two young children, unable to leave the house to help Harvey victims, more than 12,000 of whom have sought refuge in schools, churches and convention centers. She’s been preparing lunches for volunteers and is looking to do some laundry for first responders and military in the area. “It’s hard, because you see how much it devastates other people, and at the same time knowing that my life has been marginally impacted at worst. It’s hard to just kind of sit back and be OK with that. We certainly want to get out and help other people and do what we can to lift their spirits a little bit.